The finalists for the 2011 Weblog Awards have been chosen. Now it's up to all of us to help decide who gets the 'bloggie'. Each category has five nominees. All brilliant and entertaining blogs, it's hard to make a choose just one. But why not do it any way. And while you're there, check out the Music Category. Kerry Dexter, one of my co-bloggers over at Perceptive Travel blog, has had her blog Music Road, which focuses on Irish, Scottish, folk, and country music from many different neighbourhoods, nominated for a bloggie. 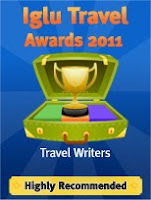 Thanks for mentioning the travel category of the 2011 Bloggies. I'm honored to be included with such quality travel bloggers. Besides voting on the Bloggies, checking out the nominations is a great way to discover new reads. And, I agree with you, Kerry Dexter's Music Road is excellent. Congrats on being one of the nominees. You're in great company. thanks for the shout out, and thanks to you, and to Donna in the comments, for the kind words.